Sexual reproduction requires fertilization, a union of two cells from two individual organisms. If those two cells each contain one set of chromosomes, then the resulting cell contains two sets of chromosomes. The number of sets of chromosomes in a cell is called its ploidy level. Haploid cells contain one set of chromosomes. Cells containing two sets of chromosomes are called diploid. If the reproductive cycle is to continue, the diploid cell must somehow reduce its number of chromosome sets before fertilization can occur again, or there will be a continual doubling in the number of chromosome sets in every generation. So, in addition to fertilization, sexual reproduction includes a nuclear division, known as meiosis, that reduces the number of chromosome sets. Most animals and plants are diploid, containing two sets of chromosomes; in each somatic cell (the nonreproductive cells of a multicellular organism), the nucleus contains two copies of each chromosome that are referred to as homologous chromosomes. Somatic cells are sometimes referred to as “body” cells. Homologous chromosomes are matched pairs containing genes for the same traits in identical locations along their length. Diploid organisms inherit one copy of each homologous chromosome from each parent; all together, they are considered a full set of chromosomes. In animals, haploid cells containing a single copy of each homologous chromosome are found only within gametes. Gametes fuse with another haploid gamete to produce a diploid cell. The nuclear division that forms haploid cells, which is called meiosis, is related to mitosis. As you have learned, mitosis is part of a cell reproduction cycle that results in identical daughter nuclei that are also genetically identical to the original parent nucleus. In mitosis, both the parent and the daughter nuclei contain the same number of chromosome sets—diploid for most plants and animals. Meiosis employs many of the same mechanisms as mitosis. However, the starting nucleus is always diploid and the nuclei that result at the end of a meiotic cell division are haploid. To achieve the reduction in chromosome number, meiosis consists of one round of chromosome duplication and two rounds of nuclear division. Because the events that occur during each of the division stages are analogous to the events of mitosis, the same stage names are assigned. However, because there are two rounds of division, the stages are designated with a “I” or “II.” Thus, meiosis I is the first round of meiotic division and consists of prophase I, prometaphase I, and so on. Meiosis I reduces the number of chromosome sets from two to one. The genetic information is also mixed during this division to create unique recombinant chromosomes. Meiosis II, in which the second round of meiotic division takes place in a way that is similar to mitosis, includes prophase II, prometaphase II, and so on. Meiosis is preceded by an interphase consisting of the G1, S, and G2 phases, which are nearly identical to the phases preceding mitosis. The G1 phase is the first phase of interphase and is focused on cell growth. In the S phase, the DNA of the chromosomes is replicated. Finally, in the G2 phase, the cell undergoes the final preparations for meiosis. During DNA duplication of the S phase, each chromosome becomes composed of two identical copies (called sister chromatids) that are held together at the centromere until they are pulled apart during meiosis II. In an animal cell, the centrosomes that organize the microtubules of the meiotic spindle also replicate. This prepares the cell for the first meiotic phase. Early in prophase I, the chromosomes can be seen clearly microscopically. As the nuclear envelope begins to break down, the proteins associated with homologous chromosomes bring the pair close to each other. The tight pairing of the homologous chromosomes is called synapsis. In synapsis, the genes on the chromatids of the homologous chromosomes are precisely aligned with each other. An exchange of chromosome segments between non-sister homologous chromatids occurs and is called crossing over. This process is revealed visually after the exchange as chiasmata (singular = chiasma) (Figure 7.3). As prophase I progresses, the close association between homologous chromosomes begins to break down, and the chromosomes continue to condense, although the homologous chromosomes remain attached to each other at chiasmata. The number of chiasmata varies with the species and the length of the chromosome. At the end of prophase I, the pairs are held together only at chiasmata (Figure 7.3) and are called tetrads because the four sister chromatids of each pair of homologous chromosomes are now visible. The crossover events are the first source of genetic variation produced by meiosis. A single crossover event between homologous non-sister chromatids leads to a reciprocal exchange of equivalent DNA between a maternal chromosome and a paternal chromosome. Now, when that sister chromatid is moved into a gamete, it will carry some DNA from one parent of the individual and some DNA from the other parent. The recombinant sister chromatid has a combination of maternal and paternal genes that did not exist before the crossover. 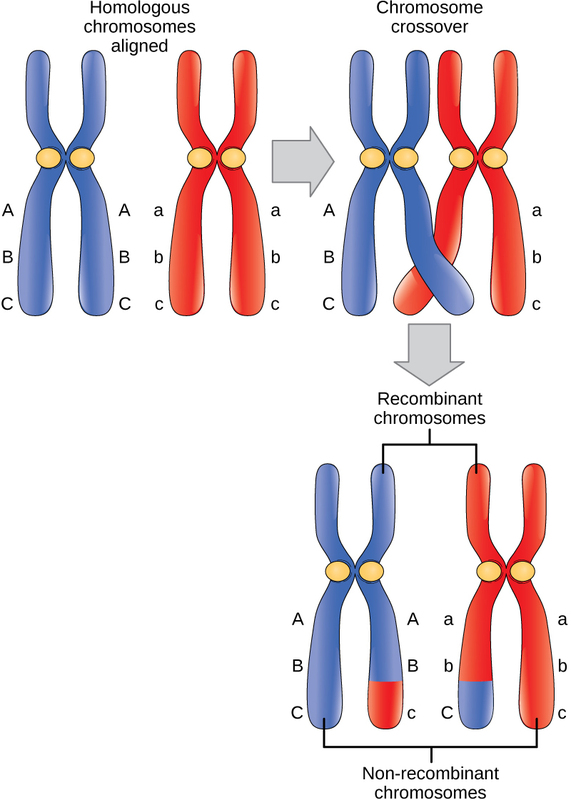 Figure 7.3 In this illustration of the effects of crossing over, the blue chromosome came from the individual’s father and the red chromosome came from the individual’s mother. Crossover occurs between non-sister chromatids of homologous chromosomes. The result is an exchange of genetic material between homologous chromosomes. The chromosomes that have a mixture of maternal and paternal sequence are called recombinant and the chromosomes that are completely paternal or maternal are called non-recombinant. The key event in prometaphase I is the attachment of the spindle fiber microtubules to the kinetochore proteins at the centromeres. The microtubules assembled from centrosomes at opposite poles of the cell grow toward the middle of the cell. At the end of prometaphase I, each tetrad is attached to microtubules from both poles, with one homologous chromosome attached at one pole and the other homologous chromosome attached to the other pole. The homologous chromosomes are still held together at chiasmata. In addition, the nuclear membrane has broken down entirely. During metaphase I, the homologous chromosomes are arranged in the center of the cell with the kinetochores facing opposite poles. The orientation of each pair of homologous chromosomes at the center of the cell is random. This randomness, called independent assortment, is the physical basis for the generation of the second form of genetic variation in offspring. Consider that the homologous chromosomes of a sexually reproducing organism are originally inherited as two separate sets, one from each parent. Using humans as an example, one set of 23 chromosomes is present in the egg donated by the mother. The father provides the other set of 23 chromosomes in the sperm that fertilizes the egg. In metaphase I, these pairs line up at the midway point between the two poles of the cell. Because there is an equal chance that a microtubule fiber will encounter a maternally or paternally inherited chromosome, the arrangement of the tetrads at the metaphase plate is random. Any maternally inherited chromosome may face either pole. Any paternally inherited chromosome may also face either pole. The orientation of each tetrad is independent of the orientation of the other 22 tetrads. In each cell that undergoes meiosis, the arrangement of the tetrads is different. The number of variations depends on the number of chromosomes making up a set. There are two possibilities for orientation (for each tetrad); thus, the possible number of alignments equals 2n where n is the number of chromosomes per set. Humans have 23 chromosome pairs, which results in over eight million (223) possibilities. This number does not include the variability previously created in the sister chromatids by crossover. Given these two mechanisms, it is highly unlikely that any two haploid cells resulting from meiosis will have the same genetic composition (Figure 7.4). To summarize the genetic consequences of meiosis I: the maternal and paternal genes are recombined by crossover events occurring on each homologous pair during prophase I; in addition, the random assortment of tetrads at metaphase produces a unique combination of maternal and paternal chromosomes that will make their way into the gametes. Figure 7.4 To demonstrate random, independent assortment at metaphase I, consider a cell with n = 2. In this case, there are two possible arrangements at the equatorial plane in metaphase I, as shown in the upper cell of each panel. These two possible orientations lead to the production of genetically different gametes. With more chromosomes, the number of possible arrangements increases dramatically. In anaphase I, the spindle fibers pull the linked chromosomes apart. The sister chromatids remain tightly bound together at the centromere. It is the chiasma connections that are broken in anaphase I as the fibers attached to the fused kinetochores pull the homologous chromosomes apart. In telophase I, the separated chromosomes arrive at opposite poles. The remainder of the typical telophase events may or may not occur depending on the species. In some organisms, the chromosomes decondense and nuclear envelopes form around the chromatids in telophase I.
Cytokinesis, the physical separation of the cytoplasmic components into two daughter cells, occurs without reformation of the nuclei in other organisms. In nearly all species, cytokinesis separates the cell contents by either a cleavage furrow (in animals and some fungi), or a cell plate that will ultimately lead to formation of cell walls that separate the two daughter cells (in plants). At each pole, there is just one member of each pair of the homologous chromosomes, so only one full set of the chromosomes is present. This is why the cells are considered haploid—there is only one chromosome set, even though there are duplicate copies of the set because each homolog still consists of two sister chromatids that are still attached to each other. However, although the sister chromatids were once duplicates of the same chromosome, they are no longer identical at this stage because of crossovers. Review the process of meiosis, observing how chromosomes align and migrate, at this site. In meiosis II, the connected sister chromatids remaining in the haploid cells from meiosis I will be split to form four haploid cells. In some species, cells enter a brief interphase, or interkinesis, that lacks an S phase, before entering meiosis II. Chromosomes are not duplicated during interkinesis. 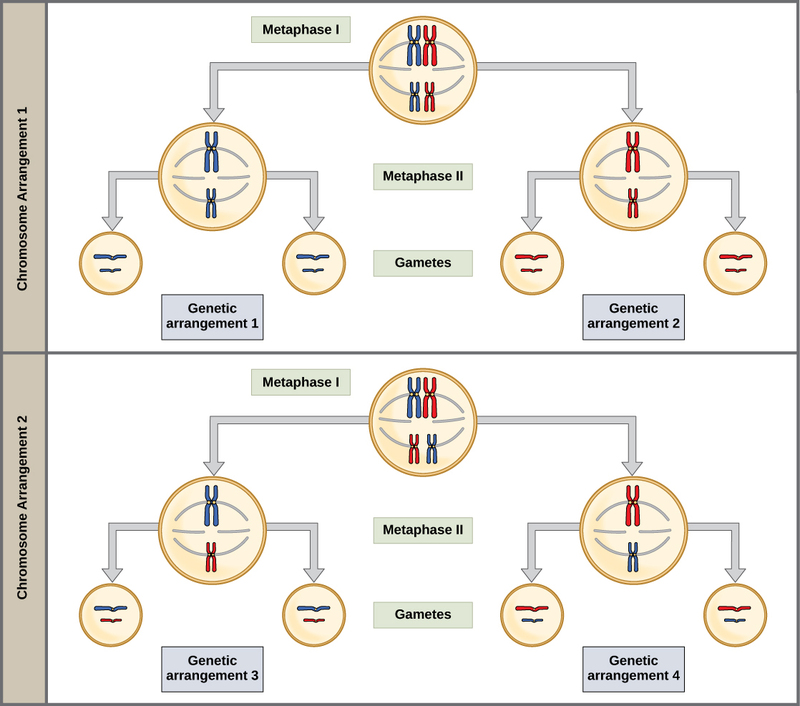 The two cells produced in meiosis I go through the events of meiosis II in synchrony. Overall, meiosis II resembles the mitotic division of a haploid cell. In prophase II, if the chromosomes decondensed in telophase I, they condense again. If nuclear envelopes were formed, they fragment into vesicles. The centrosomes duplicated during interkinesis move away from each other toward opposite poles, and new spindles are formed. In prometaphase II, the nuclear envelopes are completely broken down, and the spindle is fully formed. Each sister chromatid forms an individual kinetochore that attaches to microtubules from opposite poles. In metaphase II, the sister chromatids are maximally condensed and aligned at the center of the cell. In anaphase II, the sister chromatids are pulled apart by the spindle fibers and move toward opposite poles. Figure 7.5 In prometaphase I, microtubules attach to the fused kinetochores of homologous chromosomes. In anaphase I, the homologous chromosomes are separated. In prometaphase II, microtubules attach to individual kinetochores of sister chromatids. In anaphase II, the sister chromatids are separated. In telophase II, the chromosomes arrive at opposite poles and begin to decondense. Nuclear envelopes form around the chromosomes. Cytokinesis separates the two cells into four genetically unique haploid cells. At this point, the nuclei in the newly produced cells are both haploid and have only one copy of the single set of chromosomes. The cells produced are genetically unique because of the random assortment of paternal and maternal homologs and because of the recombination of maternal and paternal segments of chromosomes—with their sets of genes—that occurs during crossover. Mitosis and meiosis, which are both forms of division of the nucleus in eukaryotic cells, share some similarities, but also exhibit distinct differences that lead to their very different outcomes. Mitosis is a single nuclear division that results in two nuclei, usually partitioned into two new cells. The nuclei resulting from a mitotic division are genetically identical to the original. They have the same number of sets of chromosomes: one in the case of haploid cells, and two in the case of diploid cells. On the other hand, meiosis is two nuclear divisions that result in four nuclei, usually partitioned into four new cells. The nuclei resulting from meiosis are never genetically identical, and they contain one chromosome set only—this is half the number of the original cell, which was diploid. The differences in the outcomes of meiosis and mitosis occur because of differences in the behavior of the chromosomes during each process. Most of these differences in the processes occur in meiosis I, which is a very different nuclear division than mitosis. In meiosis I, the homologous chromosome pairs become associated with each other, are bound together, experience chiasmata and crossover between sister chromatids, and line up along the metaphase plate in tetrads with spindle fibers from opposite spindle poles attached to each kinetochore of a homolog in a tetrad. All of these events occur only in meiosis I, never in mitosis. 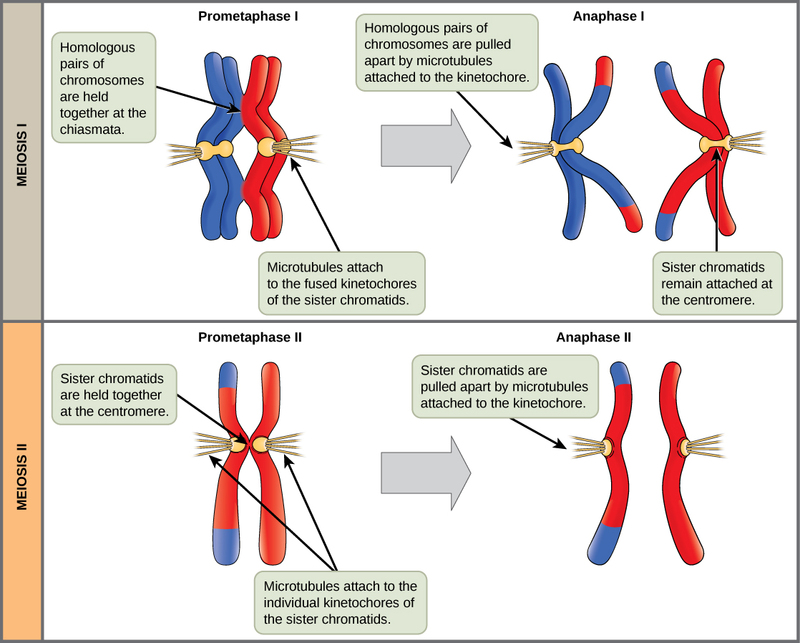 Homologous chromosomes move to opposite poles during meiosis I so the number of sets of chromosomes in each nucleus-to-be is reduced from two to one. For this reason, meiosis I is referred to as a reduction division. There is no such reduction in ploidy level in mitosis. Meiosis II is much more analogous to a mitotic division. In this case, duplicated chromosomes (only one set of them) line up at the center of the cell with divided kinetochores attached to spindle fibers from opposite poles. During anaphase II, as in mitotic anaphase, the kinetochores divide and one sister chromatid is pulled to one pole and the other sister chromatid is pulled to the other pole. If it were not for the fact that there had been crossovers, the two products of each meiosis II division would be identical as in mitosis; instead, they are different because there has always been at least one crossover per chromosome. Meiosis II is not a reduction division because, although there are fewer copies of the genome in the resulting cells, there is still one set of chromosomes, as there was at the end of meiosis I. Cells produced by mitosis will function in different parts of the body as a part of growth or replacing dead or damaged cells. They may even be involved in asexual reproduction in some organisms. Cells produced by meiosis in a diploid-dominant organism such as an animal will only participate in sexual reproduction. Figure 7.6 Meiosis and mitosis are both preceded by one round of DNA replication; however, meiosis includes two nuclear divisions. 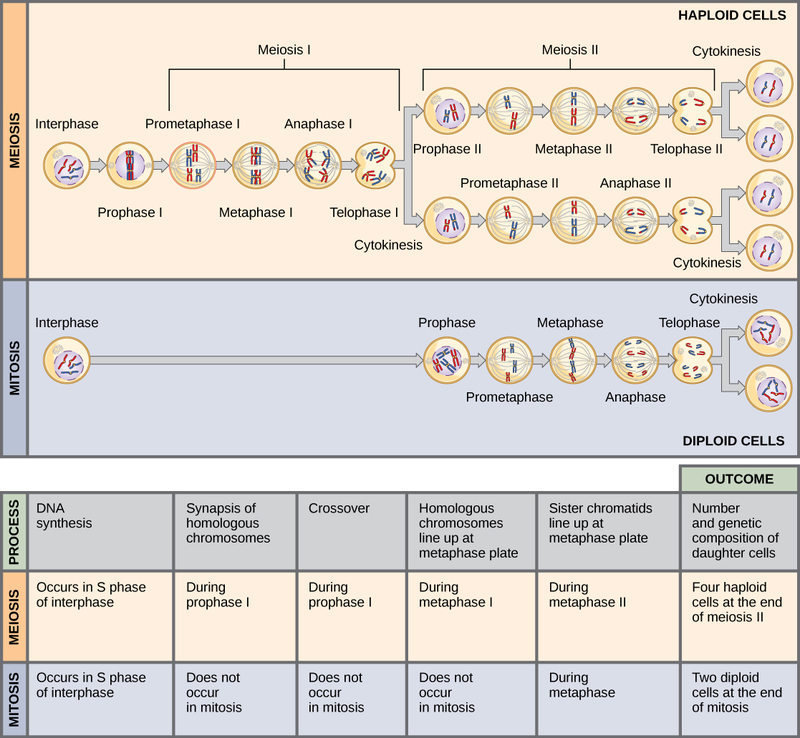 The four daughter cells resulting from meiosis are haploid and genetically distinct. The daughter cells resulting from mitosis are diploid and identical to the parent cell. For an animation comparing mitosis and meiosis, go to this website. Sexual reproduction requires that diploid organisms produce haploid cells that can fuse during fertilization to form diploid offspring. The process that results in haploid cells is called meiosis. Meiosis is a series of events that arrange and separate chromosomes into daughter cells. During the interphase of meiosis, each chromosome is duplicated. In meiosis, there are two rounds of nuclear division resulting in four nuclei and usually four haploid daughter cells, each with half the number of chromosomes as the parent cell. During meiosis, variation in the daughter nuclei is introduced because of crossover in prophase I and random alignment at metaphase I. The cells that are produced by meiosis are genetically unique. Meiosis and mitosis share similarities, but have distinct outcomes. Mitotic divisions are single nuclear divisions that produce daughter nuclei that are genetically identical and have the same number of chromosome sets as the original cell. Meiotic divisions are two nuclear divisions that produce four daughter nuclei that are genetically different and have one chromosome set rather than the two sets the parent cell had. The main differences between the processes occur in the first division of meiosis. The homologous chromosomes separate into different nuclei during meiosis I causing a reduction of ploidy level. The second division of meiosis is much more similar to a mitotic division. Meiosis produces ________ daughter cells. At which stage of meiosis are sister chromatids separated from each other? The part of meiosis that is similar to mitosis is ________. If a muscle cell of a typical organism has 32 chromosomes, how many chromosomes will be in a gamete of that same organism? Explain how the random alignment of homologous chromosomes during metaphase I contributes to variation in gametes produced by meiosis. Random alignment leads to new combinations of traits. The chromosomes that were originally inherited by the gamete-producing individual came equally from the egg and the sperm. In metaphase I, the duplicated copies of these maternal and paternal homologous chromosomes line up across the center of the cell to form a tetrad. The orientation of each tetrad is random. There is an equal chance that the maternally derived chromosomes will be facing either pole. The same is true of the paternally derived chromosomes. The alignment should occur differently in almost every meiosis. As the homologous chromosomes are pulled apart in anaphase I, any combination of maternal and paternal chromosomes will move toward each pole. The gametes formed from these two groups of chromosomes will have a mixture of traits from the individual’s parents. Each gamete is unique. In what ways is meiosis II similar to and different from mitosis of a diploid cell? The two divisions are similar in that the chromosomes line up along the metaphase plate individually, meaning unpaired with other chromosomes (as in meiosis I). In addition, each chromosome consists of two sister chromatids that will be pulled apart. The two divisions are different because in meiosis II there are half the number of chromosomes that are present in a diploid cell of the same species undergoing mitosis. This is because meiosis I reduced the number of chromosomes to a haploid state. 7.2 Meiosis Copyright © by laesoph. All Rights Reserved.